Nikon D850, Nikon 300mm f/2.8 lens, Nikon 1.4 TC III, 1/2000 sec at f/7.1, ISO 450. Lovely shot in a natural setting, Gene! A lovely lady Cardinal, Gene. Curious about the white in the background — I know it is not snow, and probably not clouds, so that leaves flower blossoms? A good-looking image with great image quality! Ron, Definitely not snow--it was a mixture of blue sky and clouds. Beautiful image with super detail. A great setting for this lovely looking Cardinal. cracking image Gene. Like the different bg. Thanks, Gene. I'm pleased to see you can retain that much definition in the clouds at that aperture. 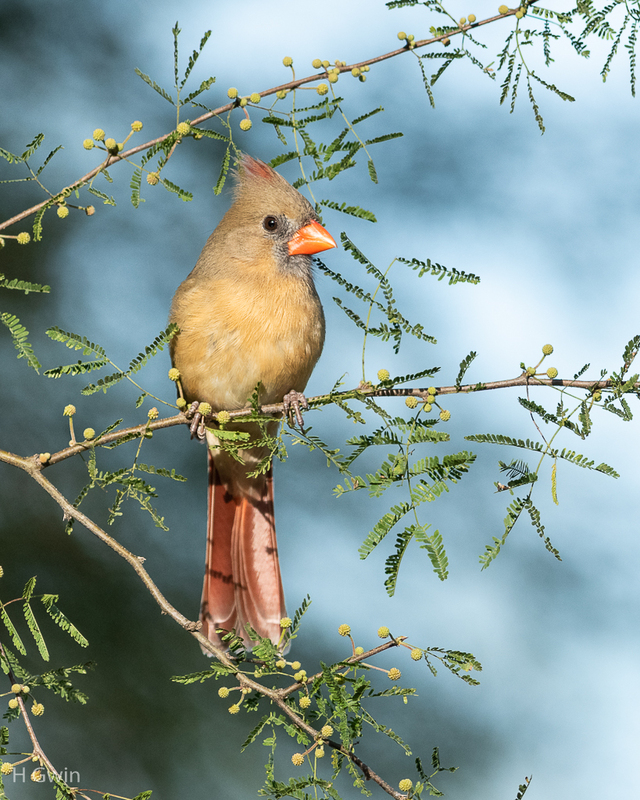 Sweet pose and surrounds- a lovely portrait of Ms Cardinal! Do you know what the plant is that she is sitting on? Creates a nice environment for her. Cynthia, This is a Huisachillo--Acacia Schaffneri. Lovely subject and setting, Gene. Beautifully done. What a nice shot Gene! I love the perch, framing and the blue BG....all blend nicely together.